Berdimuhamedov has graciously allowed Gazprom to participate in building the Turkmen section of the natural gas pipeline to China, and, as an added bonus for Ashgabat, Gazprom has agreed to study constructing additional pipelines in Turkmenistan. Eurocrats perturbed by Gazprom's growing dominance of Europe's natural gas market and its hardball capitalist tactics, take heart - several days ago Gazprom's mighty CEO Alexei Miller was humbled by Turkmen President Gurbanguly Berdimuhamedov. In tough negotiations Berdimuhamedov forced Miller to agree to pay «market rates» for future long-term deliveries of Turkmen gas, according to a brief Gazprom news release. Only seven months ago Gazprom was paying Turkmenistan 130 USD per 1,000 cubic meters. Miller subsequently stated that deliveries to Eastern and Central Europe could rise as high as 400 to 500 USD per tcm by the end of the year. Only seven months ago Gazprom was paying Turkmenistan 130 USD per tcm. How was Berdimuhamedov able to pull off his capitalist coup? The answer is simple: competition, most notably by waving competing Chinese and American interests in Miller's face. While the United States has been marginalized in Turkmenistan for a number of reasons, China has not. Since the 1991 implosion of communism, Berdimuhamedov's predecessor, «President for life» Saparmurat «Turkmenbashi» Niyazov, chafed as Gazprom paid a fraction of world market prices for Turkmen gas. Niyazov was stymied in that the former Soviet pipeline network monopoly was his sole access to the global market. When Niyazov died in December 2006, Berdimuhamedov was immediately courted by flocks of foreign energy companies eager to exploit the Caspian's last great frontier, and he decided to play some hardball with Gazprom himself. The prize is not insubstantial: Turkmenistan's government estimates its onshore hydrocarbon reserves to be 21 billion tons of oil and an astounding 25 trillion cubic meters of natural gas; its Caspian offshore reserves are estimated to be 12 billion tons of oil and 5 trillion cubic meters of gas. Niyazov left Berdimuhamedov an ace, as Russian heavy-handedness caused Niyazov to consider other options for gas exports. In April 2006, Niyazov signed a deal with China for natural gas exports and the building by 2009 of a Turkmenistan-China pipeline capable of carrying 30 billion cubic meters of gas annually. The pipeline is now under construction, giving Turkmen gas exports a potential new alternative to Gazprom. Gazprom's dark little secret is that it is heavily dependent on Central Asian gas supplies in order to divert about two-thirds of its own 550 bcm indigenous production to Russia's heavily subsidized domestic market, where it is sold at a loss. Gazprom consequently purchases about 42 bcm of Turkmenistan's 60 bcm of natural gas annual production for export. As Europe now represents nearly 70 percent of Gazprom's total revenue, if Moscow's Western gravy train is to continue, Miller needs Turkmen production. Period. The handwriting for Gazprom's old «buy cheap and sell dear» policy was on the wall in March, when the presidents of Uzbekistan, Turkmenistan and Kazakhstan presented a united front to Gazprom about increased rates for their natural gas, to which Miller was forced to agree. Miller knew that if he balked, then Beijing was more than willing to step in and buy virtually all of Central Asia's gas exports for its booming economy. In the short term Gazprom still has some cards to play with Ashgabat. Turkmenistan's energy infrastructure has suffered from decades of benign neglect, and ramping up production will require billions of dollars in near-term investments, which cash-flush Gazprom is in a position to supply. Until future pipelines are constructed, Turkmenistan still exports nearly all its natural gas to Russia via Gazprom's Central Asia-Center 1, 2, 4 and 5 pipelines, a situation that will not change in the near future. The big loser in all this capitalist backslapping, however, is Ukraine, which purchases 70 percent of Turkmenistan's gas via Gazprom. When prices rise by the end of the year to global rates, more than double the 179 USD per tcm that Kiev currently pays, the pressure on Ukraine's economy will be immense. 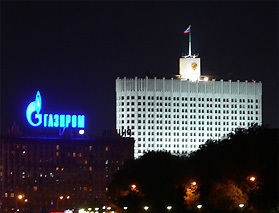 As it is, in 2007 Kiev's natural gas bill surged to 9.9 billion USD after Ukraine in January 2006 concluded a deal with Gazprom raising the price on Ukraine from 50 USD to its present level. Moscow may yet modify its pricing if Ukraine accedes to Russian concerns; its two highest priorities are to dissuade Ukraine from joining NATO and to discourage Kiev from forcing Russia to vacate the Sevastopol naval base. Should President Viktor Yushchenko's government prove amenable, then Moscow might graciously agree to delay price increases or phase them in over an extended period. Alternatively, Gazprom might be prepared to barter, as it has coveted for years Ukraine's skein of Soviet-era natural gas pipelines, which carry 80 percent of Gazprom's exports to its lucrative European markets, which it first began supplying in the 1980s, well before the collapse of communism. Ukraine has steadfastly refused to surrender the lines, much to Moscow's annoyance, but given such massive price increases, especially if the winter turns brutal, Kiev's options may dwindle. Such fiscal buccaneering has infuriated many Ukrainians; while Yushchenko's officials have mostly maintained a diplomatic silence, Ukrainian Minister of the Economy Bohdan Danylyshyn remarked that if Gazprom ratchets up the price of gas to $400 per tcm or more, then Ukraine should retaliate by blocking Russia's entry into the World Trade Organization. In the short term, however, there is little that Ukraine can do but bite the bullet. That is unless, of course, Europe boldly decides to develop the world's second-largest natural gas reserves, thereby breaking Gazprom's stranglehold. The scenario has only one slight flaw, as the reserves are situated in Iran. Accordingly, Eastern Europe and Ukraine at present have three options -- infuriate Washington, anger Moscow, or freeze. And oddly enough, NATO's military power is unable to assist Kiev in making its choice.